On a school field trip, third-graders Tony and Martha decided to do a little independent exploring. Slipping away from the rest of the group, they headed into a secluded field. 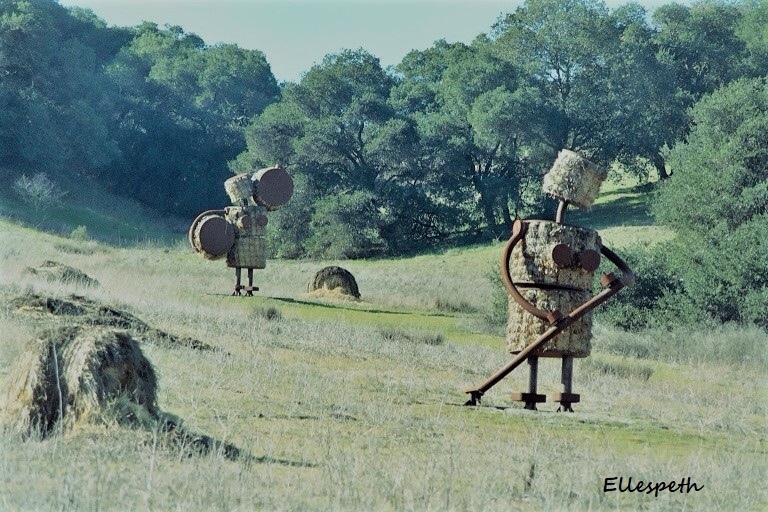 “I think they’re some kind of scarecrows or something.” The boy wrinkled his nose in thought. “Let’s have a closer look.” Tony started to run forward. He saw the expression of horror on Martha’s face and then spun toward the field. The straw people were moving. One of them was swinging her ax at him menacingly. I wrote this for the FFfAW Challenge for the Week of April 24, 2018 hosted by Priceless Joy. The idea is to use the image above to inspire the creation of a piece of flash fiction between 100 and 175 words long. My word count is 150. Yes, I noticed the two straw people were supposed to be women, and of course, the first thing I thought of was that they were haunted. This could be a start of a really thrilling horror fantasy novel. Actually, I had planned for the children to escape. Not sure what I’d do with straw women since just lighting a match around them could send them running in terror. That was seriously spooky. I’ve still got a chill in my spine. A hot pad might help. 😉 Thanks. Mad lady scarecrows! Horrifyingly good! Great story, James! I intimated that they were attacking Tony. Maybe he was trespassing. Anyway, the kids had been warned. Good lesson – always do what you’re told. Enjoyed your horror tale. Horror is replete with tales of people disobeying someone and not living to regret it. Hopefully, the kids will be ‘once hacked (almost), twice shy’ from now on. I’m thinking there’s still time to run away. Thanks.